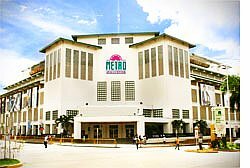 The Metro Rewards Club (MRC) is our very own customer loyalty program that makes your shopping more fun and exciting as Metro gives you satisfying returns for every peso you spend at the Metro Gaisano Supermarkets and Department Stores. Choose from an array of items you can avail for FREE when your reward points reach certain amounts. Aside from redeeming rewards, MRC members also get to enjoy exclusive promos and special discounts on premium items. So continue shopping at any Metro Gaisano Store. The more you shop, the more rewarding it gets!